Six years after the band foundation, Fast Friday from Luxemburg finally released their first EP containing 6 tracks. They decided to record at the Kulturfabrik, allowing them a perfect sound to emphasise the structural complexity of their songs. Fast Friday can be seen as a nu metal band, but their songwriting is far richer than that. The album contains lots of metal riffs, but there's also a big number of melodic, emotional and even atmospheric parts. The opener Ego Kiss is a strange track with melancholic passages, but it also has a straight forward crossover part. 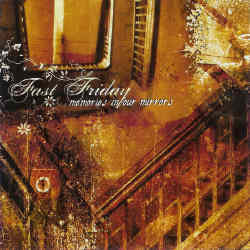 My favourite track is the following Distortions which shows Fast Friday from their most weird and psychotic side. So Died The Beautiful is a classic crossover track with chaotic screams, rap vocals and melodic vocals. A more melodic side of Fast Friday is portrayed with Desperate Perfection and My Teddy. Finally the harder This One surprises with heavy mosh parts. All three musicians and the singer who is a former member of Short[k]ut do a tremendous job and have achieved a respectable level. I first saw Fast Friday live in late 2002. Comparing them then and now, you notice that the four musicians have gained quite a lot of potential.